Re: Venus Transit- Plasma tail & Coronal Hole? what does the EU theory say about such an unexpectedly rapid change in the rotational speed of a planet, especially Venus? Could this slowing down be a consequence of the lack of an intrinsic magnetic field or is it the other way around, given that the rotational speed of Venus is already so low that a day on Venus is longer than its year? This may be of interest to you, this topic was discussed a while back in a thread titled "Venus Slowing Down?." The discussion about "Venus Slowing Down?" is located HERE beginning with the post dated at Fri Feb 10, 2012 by the Aten, with responses following.
. During a rare period of very low density solar outflow, the ionosphere of Venus was observed to become elongated downstream, rather like a long-tailed comet. Previous spacecraft measurements have established that most of the ionospheric plasma (ionised gas) on the night side of Venus is supplied by plasma moving across the terminator, from the day side to the night side, driven by plasma pressure gradients. This nightward flow, which mainly involves oxygen ions (O+), takes place about 150-300 km above the surface of Venus, with a flow speed reaching several kilometres per second. "We believe that the low solar wind pressure, which results in weaker magnetic fields, makes it easier for ions to flow from the day side to the night side of the planet." "The observations show that the night side ionosphere moved outward to at least 15 000 km from Venus' centre over a period of only a few hours," said Markus Fraenz, also from the Max Planck Institute for Solar System Research, who was the team leader and a co-author of the paper. "It may possibly have extended for millions of kilometres, like an enormous tail. Perhaps the most dramatic discovery was a steady increase in the mean cloud top wind speeds at low latitude from around 300 km/h to almost 400 km/h (80 - 110 m/s) in the period 2006 - 2013. "This is an enormous increase in the already high rotation rate of the atmosphere," said Igor Khatuntsev. 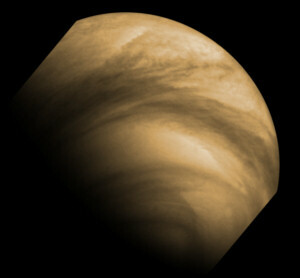 "Such a large variation has never before been observed on Venus, and we do not yet understand why this occurred." This is approximately the period of Solar Cycle 24, from minimum to maximum. "Long-term studies based on tracking the motions of several hundred thousand cloud features, indicated here with arrows and ovals, reveal that the average wind speeds on Venus have increased from roughly 300 km/h to 400 km/h over the first six years of the mission. (Khatuntsev et al.)" No explanation provided so far. what, you don't think it's an Electric Venus phenomena ? It is not just Venus. The whole solar system, including the Sun, is changing. That is one of the effects of the Sun's driving current change. The question is, what is driving the solar current change? A comparison of the ionosphere of Venus under different solar wind conditions. The yellow lines indicate the solar magnetic field lines as they interact with the ionosphere. ...This makes it easier for ions to flow across the terminator. A rare opportunity to examine what happens when a tenuous solar wind arrives at Venus came 3 - 4 August 2010, following a series of large coronal mass ejections on the Sun. NASA's STEREO-B spacecraft, orbiting downstream from Venus, observed that the solar wind density at Earth's orbit dropped to the remarkably low figure of 0.1 particles per cubic cm and persisted at this value for an entire day. "This coupling is reciprocal - in that the characteristics of both regions affect the other. These interactions may be particularly strong and the processes most varied at natural boundaries within the system, such as the plasmapause or auroral/polar cap boundary where surface waves can be set up along the gradient regions separating different plasma populations. Enjoy the 10 page paper-it takes on Thunderbolts for not acknowledging a model already presented for years. Just as we EUers are ignored by mainstream, Miles Mathis is routinely ignored when his model addresses the very mysteries we discuss. This one is actually easier than everyone is making it. Why should the atmosphere be speeding up, while the lower surface is slowing? And what does it have to do with the solar cycle? The short answer: The mainstream has correctly linked the solar cycle to the amount of ionizing and dissociating on Venus. But what happens to charge in the high pressure atmosphere of Venus, is that ions and electrons diffuse outward at different rates as talked about (on a whole different scale) here: http://adsabs.harvard.edu/full/1997BASI...25..579D Basically, because of the extreme pressure on Venus, we end up with charge separation by depth. The upper atmosphere is oppositely charged than the surface, and therefore we get the opposite affect on rotation. Miles Mathis is correct about the circuit, in that we have to stop thinking that the planets get most of the current from the sun. The planets are in parallel, more than in series with the sun. It's the same point I was making with the magnetic field. The magnetic field of the sun clearly does not shape planetary orbits. The sun AND planets spiral through the same external field. Mercury does not spiral in a torus about sun's equator, or spiral in to one of the sun's poles, etc. Five or so years ago a few of us were extolling the work of Mathis here on the forum, as i was passing T'bolts postings on to Miles, while most were poo-pooing it. I agree, as much as I love what the Thunderbolts/EU guys are doing, there are some problems in the basic theory that Miles picks at in this paper that need to be addressed and not ignored. But his explanation of Venus' increasing winds and decaying orbital speed are straight outcomes of his mechanics; I don't know of any other current theory that can explain both with straight mechanics.